India is a land of festivals and Dussera is one of the important festivals celebrated. It is mainly celebrated by the followers of the Hindu religion. Dussera is basically a celebration marking the victory of the Hindu god Rama over the evil Ravana. Dussera is also marked as the tenth day of Navratri. During Navratri, Goddess Durga is worshipped in all her three forms. The first three days of Navratri, Goddess Durga is worshipped, the next three days Goddess Lakshmi is worshipped, and the last three days Goddess Saraswati is worshipped. It is believed that Goddess Durga kills the evil spirit Mahishasur on the tenth day i.e on Dussera. Hence people world wide believe that Dussera is a festival of happiness as it symbolizes the victory of good over the demons like Ravana and Mahishasur. Goddess Durga’s idol is also immersed on the day of Dussera in some parts of India. The main reason behind celebrating Dussera is, the Hindu God Ram, killed the demon Raavan, who had kidnapped Ram’s wife Sita to his empire of Lanka. To save his wife from these demons Ram and younger brother Lakshman along with a sincere devotee Hanuman and an army of monkey fought a ten day long battle to save Sita. 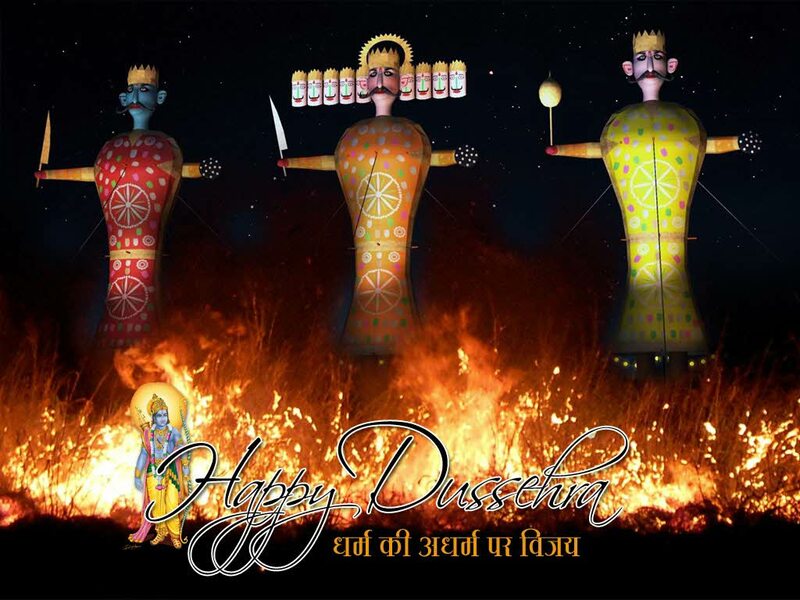 To mark this victory Dussera is celebrated widely in the northern part of India in states like Uttar Pradesh, Haryana and Madhya Pradesh where Dussera is celebrated with a tradition of Ramlila where they enact how Ram burns the effigy of Ravan in small play or skit. Thousands of people come to witness Ramlila from all parts of the world. In the states of Orissa, West Bengal and Assam Navratri is celebrated as Durga puja on the last four days. These celebrations see the married women play with sindoor. In Maharshtra people are seen exchanging gifts, sweets and the leaves of the Apta tree (Prosopis spicigera). It is said that these leaves symbolizes gold and bring prosperity. In some parts of Rajasthan and Gujarat men and women are seen dancing “Garbha” and “Dandia – Rasa” in colorful costumes. Dussera is commonly known as Vijayadashami in the south India. In Tamil Nadu people arrange dolls and idols on steps and call it “kolu”. Dussehra is celebrated with great enthusiasm all over the country. It is said that the grand celebration of Dussehra started in the 17th century, during the rule of the Mysore king. Dussera usually falls in the month of September or October. It is celebrated on the first nine days of the Hindu month Ashwin. It is believed that people worship and ask for blessings from all kinds of household and work-related instruments and tools, like the stove, cooking pans, knives, books, computers, and vehicles on this day. This season is considered to be auspicious for venturing new businesses, buying new houses, making investments in gold and silver and so on. It is believed that any new beginning in this season only brings prosperity and success to the people.